My scrap journal isn't laying flat any more so I am leaving some of the edges visual. Otherwise if I crop it down to just the collage, the page looks really strange. 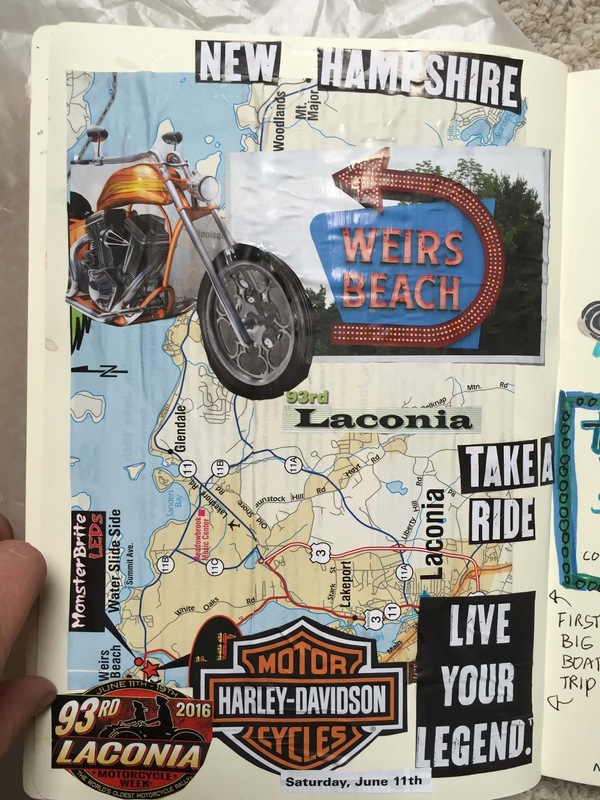 I am also linking up to Art Journal Journey since I included a map, which is his month's theme. This month is hosted by the talented Mary. And I have a second journal page today which I am linking up to Moo Mania. 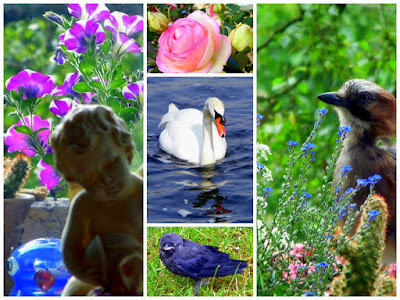 The new theme is anything based this beautiful photo collage by Valerie. I am also linking up to Paint Party Friday, hosted by Eva and Kristen. So the good new is exams start today and tomorrow is it with the kids. Yup, I am ready, even though I have a bunch of stuff to do between now and Monday. But summer break is almost here! Now I just need to keep my eyes on the prize and keep thinking positive. It is almost here. Lots of lovely work today, love the journal pages, both are gorgeous. It's a good idea to really scrap about what you are up to. Thanks for joining us at AJJ and MM&M, and thanks for liking my photo! Cool page - love the imagery and theme.. a great keepsake of a fun day. Hope you get all you need to done and have a great weekend. Oh my gosh! Two super pages! 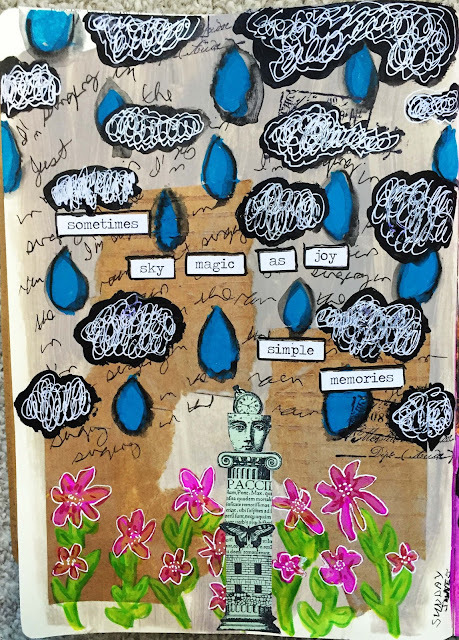 You are an Art Journal heroine! WOW! Aren't you glad you picked up a FREE brochure rather than buying an expensive patch to make this page? And it is probably even more lovely than having just the patch. This is a wonderful journal page, and I can relate to pages no longer lying flat. That's a very energetic MM&M page, too. I could feel the energy even as I saw the calm of the flowers and butterfly. Great juxtaposition. I can feel how ready you are to get the flock out of school and leave it behind for the summer. Two fabulous pages. I did read your earlier post and your memory page looks wonderful. Great pages, both of them. Your motorcycle page is a real keepsake. You can look back in years to come and remember the fun you had there. Have a wonderful summer. Love your map journal page-I really need to be doing more scrap art pages like this-I do have a smash book I have yet to use:) Marvelous take on Valerie's collage! And happy "school's out for summer" to you! I love the idea of a memory journal. Great pages! I really like your pages, especially that first one. You did an outstanding job combining all those images, map and text. Blessings! lol, ad legs and ears on the last one and you have sheep :) COOL! What lovely art! It has such a great energy. Such a great peek into your world through your pages!! I do like them both, one for the memories and collage, the other for the great colour!! Wonderful! So nice that you could take this brochure and then create with it. Sounds like a good time. Have a wonderful Sunday. Excellent memory keeper of a good excursion. It has come out very well. Good luck with the end of school year. You inspire me with your journal pages. I must try this but there never seems to be enough time.